I am pleased to report that I have finally "won" in Ultima Online! Well, it has been almost a month since I last spouted off about UO. 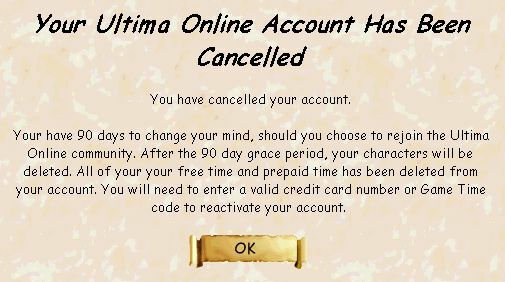 During this month, I have logged in approximately… uhh… 3 times. Once to see if the keep on Hokuto was still standing (it is). Once on Atlantic to get a screenshot of my paperdoll for Ra. And once to check out Siege Perilous. Well, actually I had to log onto SP about 4 times because of all the crashing, but more about this later. 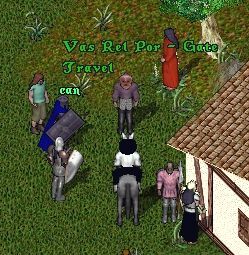 During this month, as no doubt you have discerned from my constant gloating and other section of the site, I have been blowing tons of time in the Asheron’s Call beta, which I have been enjoying a hell of a lot. Of course, I keep reading other sites about UO even when I’m too disgusted to play it, and so heard a lot more crap, which I kept thinking of commenting on, but (1) there was never enough material to make up a really substantial rant, and (2) I would just be parroting some other guy who got the news before me. Well, that’s what I do anyway. However, since J. had to go and plug my site as a rant site, I’ve decided that I should toss a bunch of worthless junk together and pretend it’s a rant. Then I can go back to reading Sluggy Freelance with a clear conscience. Aha, a travesty is averted. Lum was asked by someone claiming to be GM Gabriel to remove the pic from the Darwin section, since it was in fact him and not Darwin. Or so he says… In a humorless, very official-sounding request, GM Gabriel cited the possibility of personal endangerment if he were to be recognized as “GM Darwin” outside of the OSI offices and maybe beaten up for his lunch money. In this spirit, I would like to lay all the blame for the mistake on the anonymous source for telling me it was GM Darwin in the first place. But what the hell… the pic is still funny. Had a few email exchanges with Lum, in which the identity of the mystery GM was debated. Mrs. Darwin insisted it was not him. Someone else thought it might have been Datura, but I can’t imagine Datura going to a player function without an EOD armored bodysuit and a waiting ambulance. Lum concurred… “If it was Datura I’m sure I would have had to bail Murm out of jail later.” I personally don’t really care that much, since as I said, it’s just a funny picture of a dorky GM staring off into space. However, there are more important things to worry about…… like the Asheron’s Call test has entered Beta One, and the NDA has been lifted! Muchos gracias to Lum the Mad for providing some positive ID’s on some of our suspects. A reader who will remain anonymous until he says he really wants his name here (so he can be recognized by the 5 people who read this page) sent in this clipped-out image from BritFest ’99, claiming it to be an accurate photographic representation of the former GM of the hour. He apparently gave himself away via a subtle clue (the name tag that said “GM Darwin”), and gave a short speech on why recalling into banks on Great Lakes had been temporarily disabled before dark-clad bodyguards hurried him into a waiting limo. Can this be real estate tycoon and ex-red-robed deity known only as “Darwin”? We may never know, but i still laugh when I look at those GM pictures, so I figured I’d post it. The presence of a cheesy red arrow just makes me laugh more. I read an excellent rant on Dundee’s site (not the MoB Dundee, the RCGUO Dundee) about “roleplayers”. Damn if this doesn’t bother me about as much as it seems to bother him. After a boring weekend which consisted largely of replacing my car and wondering if it was worth it to ever attempt to run an RPG campaign ever again, this one just set me off. I started typing one of my typical super-long boring Mu replies to his message board, when I realized SitePowerUp would probably cut it in half, so here it is.The RP Nazi attitude is prevalent everywhere, even (and most disturbingly so) in the realm of pen and paper RPG’s. The problem lies in the term, “roleplaying”. It would seem pretty simple to define… “playing a role”. But people add all sorts of nonsense to the definition based on their experiences, what they’ve read in some really terrible fantasy fan fiction, and their own delusions. This is where the problem happens… people enter an “RPG”, whether it’s some tabletop thing, EQ, even UO, with an expectation that (1) it is a roleplaying game, and more importantly (2) it will fit perfectly with their idea of what roleplaying is. These people wear the badge of “roleplayer” proudly, and gives anyone who even thinks about roleplaying a bad name.